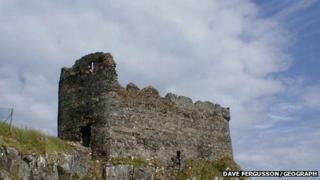 A team carrying out preservation work at Mingary Castle, on the Ardnamurchan peninsula, discovered the "graffiti" on plastered walls of the chapel. Some of the simple markings are thought to represent a ship and the first letter of someone's name. The archaeological team believes the markings may date from when the chapel was first built, between 1265 and 1295. Local historian Jon Haylett, who lives in the nearby village of Kilchoan, said the markings had been found by architectural consultant Tom Addyman and his team. Writing in his Mingary Castle blog, Mr Haylett said: "During the recent clearance work on the chapel, Tom found the graffiti in at least four areas of its walls. "It's pretty simple stuff, the sort of marks that would have been made by an illiterate man. "One 'picture' looks remarkably like Ardnamurchan lighthouse, another seems to be a ship, above, while a third suggests to me that the plasterer's name may have started with a capital 'I'." Speaking to BBC Radio Scotland, Mr Haylett likened the discovery of the markings to the builders "talking" through history. "They've left messages on the wall and we're reading them," he said. "This must be amongst the oldest graffiti in Scotland. "As far as medieval times are concerned, this is possibly the oldest graffiti we've got." The markings were discovered during work commissioned by the Mingary Castle Preservation and Restoration Trust.